Gwyneth Roberts, an Honors student majoring in Mathematics and Ecology & Environmental Science, won the award for Outstanding Undergraduate Student Contribution to Sustainability Research, given by the Senator George J. Mitchell Center for Sustainability Solutions. Center director, Dr. David Hart, presented the award on December 10, 2018. Roberts has been doing her thesis research with advisors Dr. Lauren Ross (Civil Engineering) and Dr. Thomas Bellsky (Mathematics) on the tidal flow in the Jordan River estuary near Trenton, Maine. The thesis builds on prior work on coastal pollution by the NEST Safe Beaches and Shellfish Areas Project of the Center in partnership with Acadia Aqua Farms, an important stakeholder involved with shellfish harvesting in Maine. Her thesis work involves measurements of tidal flow that can be compared with 1-D and 2-D numerical models that she is adapting to the dimensions of this river with the help of committee members Sean Smith (ECS & Mitchell Center) and Neil Fisher (CIE). 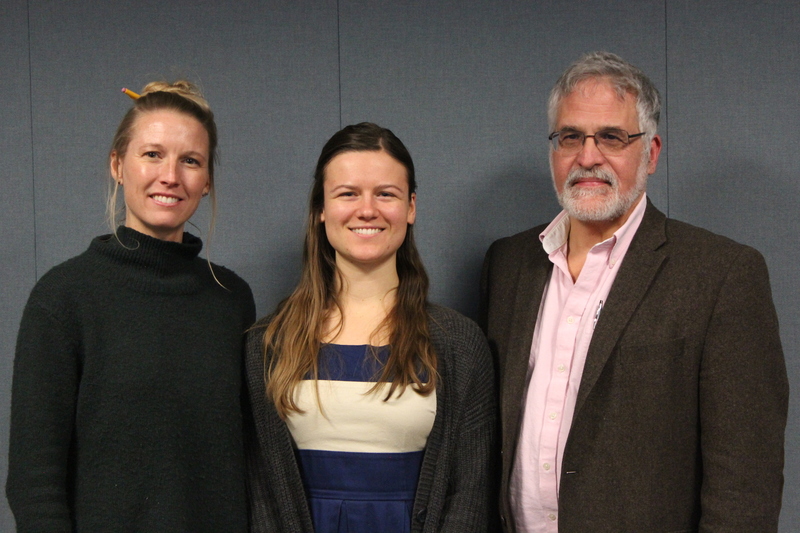 Gwyneth is shown here with Dr. Ross and Honors Dean François Amar, who also serves on her thesis committee.